Do you like kicking back and relaxing around the campfire at the end of the day, possibly with a drink of your choice, in your hand? 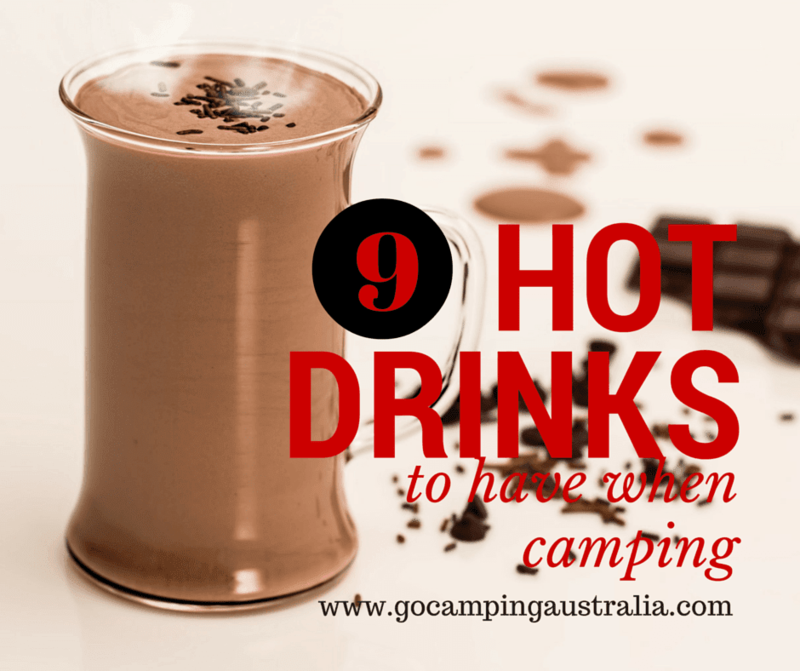 If you are looking for something a little different on your next trip, then we have put together a list of our top 9 camping drinks for cold nights. And if you are not a camper – then every one of these drinks can easily be made at home! After dinner, this would be the perfect time to try this! Use at least 3 tablespoons of Frangelico, stirred into a 1/2 cup of hot water, and then add whipped cream (for camping, take a can of cream). Stir it all together and enjoy! Not your everyday hot chocolate from a tin…..Real hot chocolate is what I am talking about. The drink with chocolate pieces, cream, and cocoa! Lots of variations out there, but they all feature the same key ingredient – good chocolate!! Add your own twist to your hot chocolate – cinnamon stick added to the saucepan when warming the milk. If you are making this at the campsite, prior to leaving home, just put the spice ingredients together in 1 bag, so you have it all ready to add to the cider at the campsite. And read on to see the caramel version! This is another hot chocolate recipe, but different enough from our earlier one – because of the addition of caramel. You can use the caramel that comes from a jar, but the better quality caramel sauces you get, the better the flavour! Salted caramel sauce will give a different flavour again! You need a saucepan for this recipe. In a large saucepan combine sugar, cocoa powder, and water. Cook and stir over medium heat until sugar is dissolved. Add caramel lollies; cook and stir until melted. Stir in milk. Heat through. Pour into mugs; top with whipped cream (optional) and additional caramel lollies. Maybe just before bedtime, this is the one to have! Helps everyone to go to sleep! Stir in a saucepan all the ingredients, and serve! This is also called Irish Coffee. It combines the yummy drinks of Frangelico and Baileys! Just make some good coffee and add the rest! The quantities of alcohol you add of these will depend on your tastes. But a good starting point is 1 ounce of each! When chocolate and peanut butter meet, it’s a taste sensation. We generally always have chocolate and peanut butter in our food box, so this one doesn’t take much planning! Warm milk and cream in a medium saucepan over a medium-low heat. Add chocolate, and whisk until melted and combined. Continue to warm mixture until thick, about 5 minutes. Whisk in peanut butter until smooth. We featured this before on the blog and it’s pretty good! This version is easy to make – I have seen a lot more complicated versions, but as you are camping, it’s best to err on the side of simplicity and fewer ingredients. Combine apple cider, caramel, and vanilla into a saucepan. Heat over medium-high heat, stirring constantly until apple cider is hot and caramel has melted. Alcoholic version: instead of the caramel sauce, you add caramel vodka. With any drink involving alcohol, please drink responsibly. Like this story? Then share like crazy using buttons below.